Dessa is a hip-hop singer/songwriter with solo performances as well as through the group Doomtree. I had first heard of her through the song "Call Off Your Ghost" that was featured on the podcast Welcome To Night Vale. It's a song that grabbed me immediately with it's emotion and her singing. I looked up the rest of her discography at the time, which I enjoyed just as much. It's an eclectic mix of rap and hip-hop rhythms with some classical allusions along with the everyday elements of heartbreak, sadness and trying to relate to others. The first paragraph of the prologue. Wow -- this is an intense, exciting book that will keep you enthralled until the last page. I must admit, I was up after midnight last night because I had to find out how it ended. 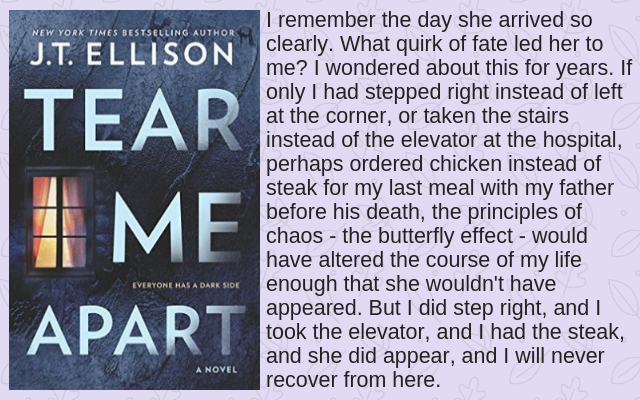 There were so many twists and turns in this novel and just when I thought I had it all figured out, I found out that I was totally wrong. The ending is a surprise but is absolutely perfect. Ella Boudreaux managed to leave an abusive marriage and settle in Cottonbloom, a small town straddling the Mississippi River. She invested money in the Abbot Garage, hoping to help get it into the modern era and evoke some of her happiest memories. Unfortunately, buying out a portion of the garage set off Mack Abbott, who wants to keep the garage all family owned. The two are at odds but still attracted to each other. Educated: A Memoir is on the summer reading list put out by the 44th president. It's a fascinating entry since the author grew up in a survivalist family that was deeply suspicious of the government. Tara Westover's book is the story of what it was like to grow up as a home-schooled Mormon, a girl taught that women had to submit to men, and, that around every corner, the Feds waited to take her rights away. Alice Walker’s The Color Purple, published in 1982, tells the story of Celie, a Black woman in the South. Celie writes letters to God in which she tells about her life–her roles as daughter, wife, sister, and mother. In the course of her story, Celie meets a series of other Black women who shape her life: Nettie, Celie’s sister, who becomes a missionary teacher in Africa; Shug Avery, the Blues singer her husband Mr. ______ is in love with, and who becomes Celie’s salvation; Sofia, the strong-willed daughter-in-law whose strength and courage inspire Celie; and Squeak, who goes through awakenings of her own. Throughout the story, though, Celie is the center of this community of women, the one who knows how to survive. I mentioned in my August wrap-up post that I was looking forward to watching Jack Ryan on Amazon. I was a bit worried about how it would translate to television. I recently binge watched the 8 episode season and here are my thoughts. Have you watched it?